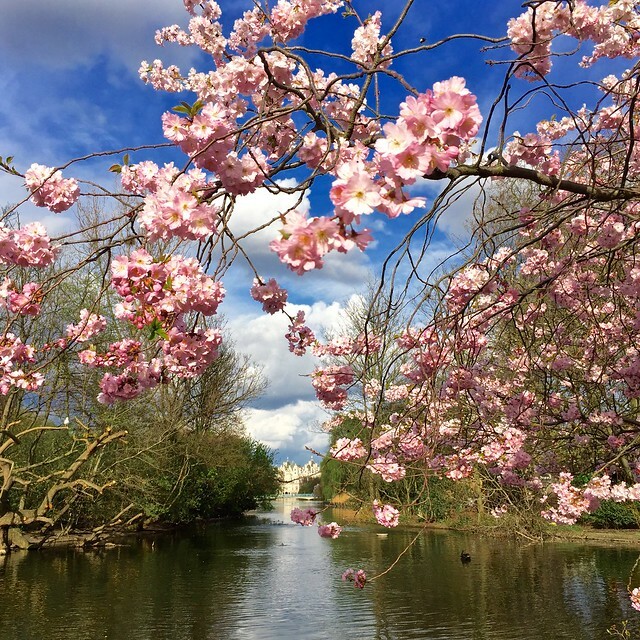 Welcome to my London cherry blossom top five guide, the definitive illustrated guide to the best cherry blossom viewing spots in the capital, from Kew Gardens to Greenwich Park. And if you want to know when the blossom’s in bloom, you can find out from my new When can you see cherry blossom in London? guide. 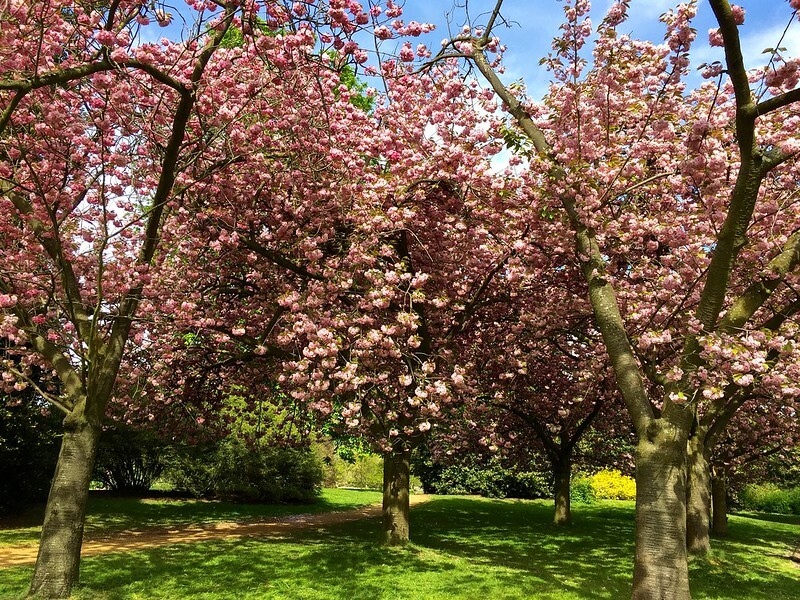 Kew Gardens gets its place at the top of the list because it’s got more blossom and more varieties than anywhere else in London. The famous cherry walk begins at the Rose Garden behind the Palm House with a great collection of Japanese cherries, including ‘Hatazakura’, with white single flowers, that originated from a tree grown in the Hakusan Shrine in Tokyo, the pink-blossomed Prunus ‘Kanzan’ and the Great White Cherry (Prunus ‘Taihaku’). The walk continues via King William’s Temple and the Temperate House and ends with a formal avenue of fifteen pairs of chrysanthemum-flowered Prunus ‘Asano’. A good bet if you’re looking for some blossom in the centre of London is Regent’s Park, which offers a whole variety of cherry blossom experiences. For early blossom, there’s a beautiful grove of pink-blossomed trees at the south end of Avenue Gardens. But the real glory comes later in the season when there’s cherry blossom all the way from the English Garden through Queen Mary’s Garden to the Jubilee gate and the Triton Fountain. The avenue of cherry trees on either side of Chester Road was replanted in 2015 with new trees, a paler variety than previously called Sunset Boulevard. You can help preserve this avenue by sponsoring a cherry tree. Kensington Gardens has a fine early-flowering grove of pink and white trees near the Lancaster Gate entrance. And a perfect little grove of pink blossoming trees near the Albert Memorial on the East Albert Lawn. It’s a favourite hanami picnic spot for the Japan Society. 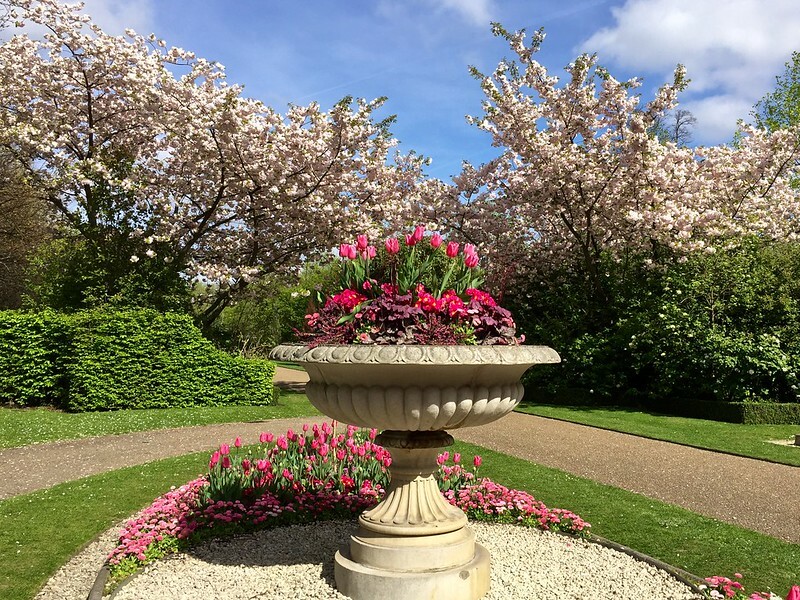 Take a tour of the Kensington Gardens cherry blossom. St James’s Park has some lovely blossom but it’s individual trees that have impact rather than massed ranks. 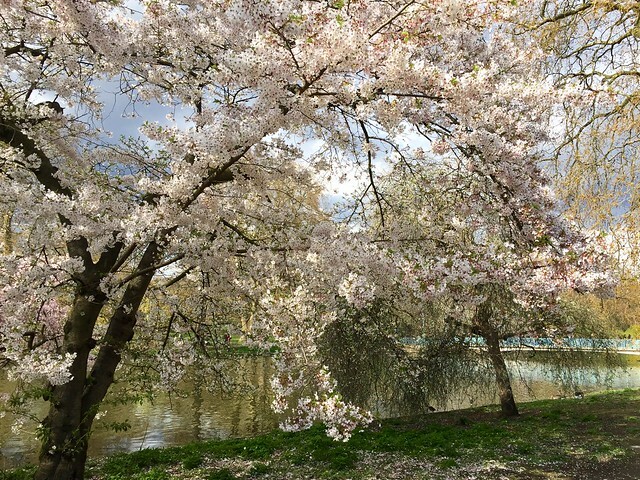 There’s a group of cherry trees near Storey’s Gate (in front of the Treasury building) and a beautiful little grove of four white cherry trees on the south side of the lake, plus a lovely tree by the lake at the Buckingham Palace end. I’ve put these in at joint number five because one is in North London and the other in South London, so you can pick the nearest. Alexandra Palace has nearly thirty early flowering trees, with grass to sit on and fantastic views over London. 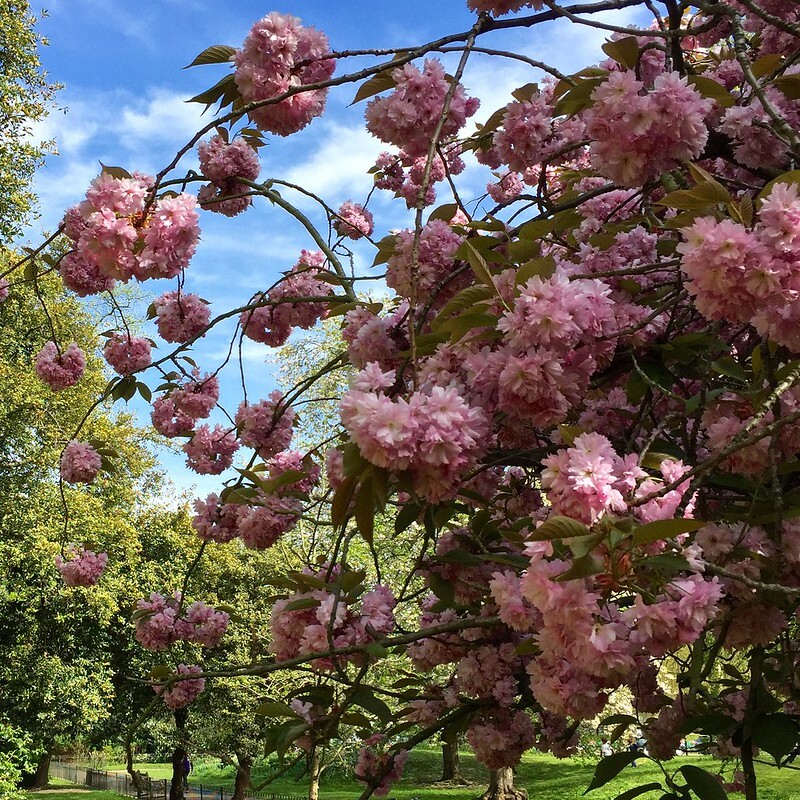 Take a tour of the Alexandra Palace cherry blossom. Greenwich Park has a lovely late flowering avenue of cherry blossom leading up to the rose garden at Ranger’s House (at the top of the hill, not far from the Observatory). It’s always difficult to call the timing on cherry blossom. The season generally runs from late March to early May but precise timing for each location depends on the weather and the variety – some trees blossom early and some late. A cold spring can set the whole season back weeks, while early sunshine can bring the blossom out several weeks earlier than expected. If you see very early blossom, in February or early March, chances are it’s plum not cherry. See my Plum v Cherry Blossom Guide to help you tell the difference. My When can you see cherry blossom in London? guide gives you the full story on timing. If you like cherry blossom, you might like my East-West fusion murder mystery, The Cherry Blossom Murder – Join expat Londoner Josie as she finds a body under the cherry blossom and tracks down a backstage killer in Tokyo. Available on Kindle or in paperback, it’s the first book in my Josie Clark in Japan mystery series. 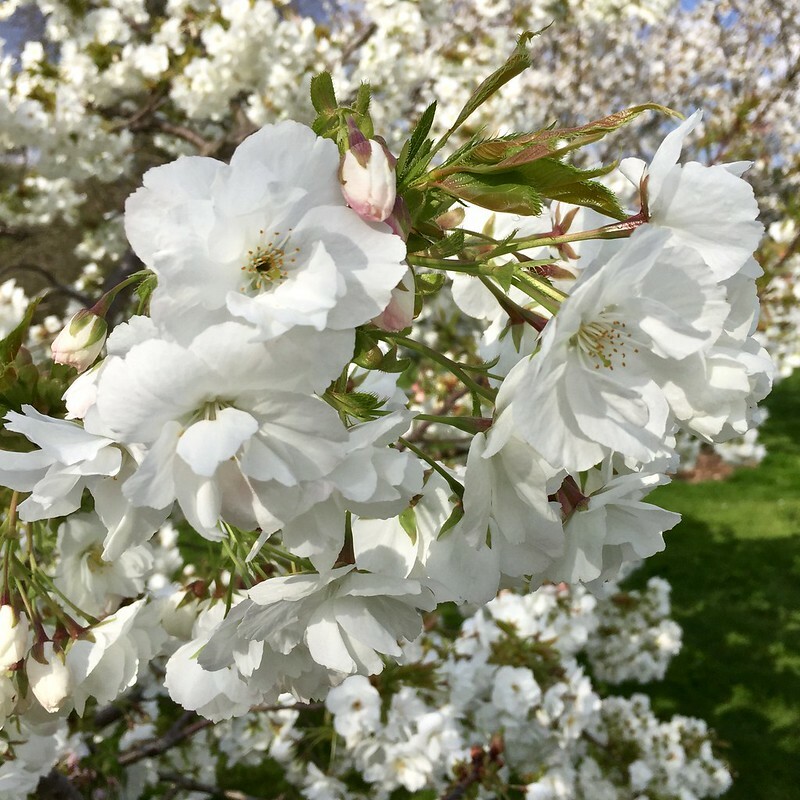 This entry was posted in Cherry Blossom, Flowers and plants, Kew Gardens, Regent's Park and tagged cherry blossom viewing, flowers, Greenwich Park, guide, Kensington Gardens, London, nature, St James's Park, top five by Fran. Bookmark the permalink. Beautiful pictures. I’ll hope to head down to Regent’s Park when the weather improves. Which reminds me – I’ve been wondering if the blossom in this picture on my blog is from a cherry tree (http://cyclingwithheels.wordpress.com/2013/03/23/spring-is-a-state-of-mind/). Is it? It looks like cherry blossom to me, but I’m not an expert. Try the Kew fact sheets. They should help you identify it. I really hope it gets warmer so we can actually go out and enjoy the cherry blossoms! さむすぎ! Such a fantastic idea for a post! Since my brother told me all about it (he has been to Japan several times) I always dreamed to see the cherry blossoms (sakura?) flowering in Kyoto but, silly me, I never thought I could enjoy the same view here in London. I hope spring will arrive soon so to follow your great advice. Thank you! Although it is a main road, The Hampton Court Way, from Hampton Court to the Scilly Isles, is fantastic for Cherry Trees when they do flower (When will Spring arrive ???). Thanks for the post. Thanks for telling me! I’ll try and see it if I can. Yes – and the settings are so different too. What a wonderful post! I didn’t even realise we had a variety of cherry blossom growing in our London Parks. I’ve been in Japan this sakura season so perhaps I’ve missed London’s flowers this year, but next year I will certainly go looking for them. Thanks for sharing! I’m following your blog for more Japan-in-Britain goodness to help me stave off the holiday blues when I’m home! My favourite is a huge one in Golders Hill Park – part of Hampstead Heath. Great – I’ll add it to my list. There don’t seem to be all that many cherry trees on Hampstead Heath. This is a little park off the main Hampstead Heath where they have animals too. 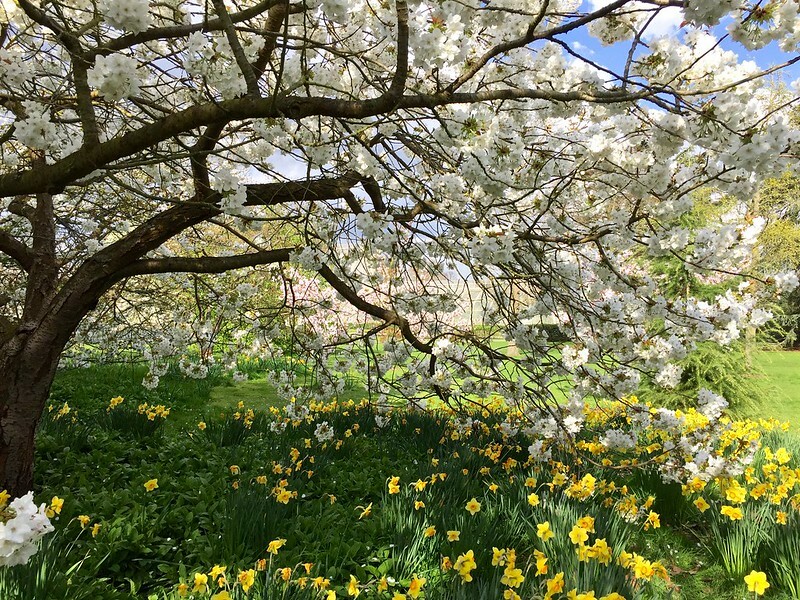 It’s only one cherry tree in the middle of the park but it’s stunning with the daffodils below. Okay, I should be able to track it down from your description! I’ve just been chatting to someone who says there are lots of rows of cherries in Hampstead Garden Suburb that the Japanese all come to see too! Brill, thank you, I bet they’re great. I’ll try and get down there and take a look. This is such a great post! I was wondering which London parks to visit with my camera in order to snap some great cherry blossom pictures. The residential streets around Herne Hill are beautiful right now, multicoloured cherry blossom all over the place. I’m glad you like it! I wrote it because so many people seemed to be searching for cherry blossom in London and there didn’t seem to be anything to tell them where it was. I’ll add Herne Hill to my list! Hi Fran, Thank you for visiting my site – I’m delighted because I love your blog. I totally agree with you about THAT tree in Deansway. I know exactly which one you mean. I’ve been oohing and aahing over it for the past few weeks. Every year I go on a walk around that area, raving over the trees and saying how much they remind me of one magical night near Osaka Castle! It’s brilliant, isn’t it! Also, I went to Cherry Tree Park and they had some lovely blossom there too. Hello! Thanks for liking my ‘about’ page. I’ve just read your recommendations for cherry blossom in London. I’d not realised that there were so many places to see them! Although I’ve probably missed them this year (as I assume they only flower during April/May..?) I’ll look out for them next year. Your blog has definitely inspired me to go to Kew Gardens too. A lot of my china has flower patterns or garden scenes and I want to learn more about flowers so that I can recognise them better! Yes, I’m afraid it’s too late for cherry blossom this year, but there’s always something lovely to see at Kew. I find I go there a lot now, even though it’s a bit of a trek from North London. I like your china blog very much – good luck with it! Superb… I’m a photographer and looking to do an Japanese/Anime style shoot and looking for places with cherry blossom to give a more natural Japanese feel. These places will be perfect for creating something beautiful..
Great – and spring’s not that far away! is there a cherry blossom festival (hanami) in london?? Try the Japan Society – they hold a hanami picnic every year. PHOTOGRAPHER LOOKING FOR PINK BLOSSOM BACKDROP! I was wondering if you’d be able to tell me where you think my best bet would be for this kind of thing? Am I too late for the pink blossoms or do I still have time do you think? Your best bet is the cherry blossom avenue in Greenwich Park which is currently still in bud. It should be in full flower in a week or two, depending on the weather. Thanks – I’m always on the lookout for cherry blossom! 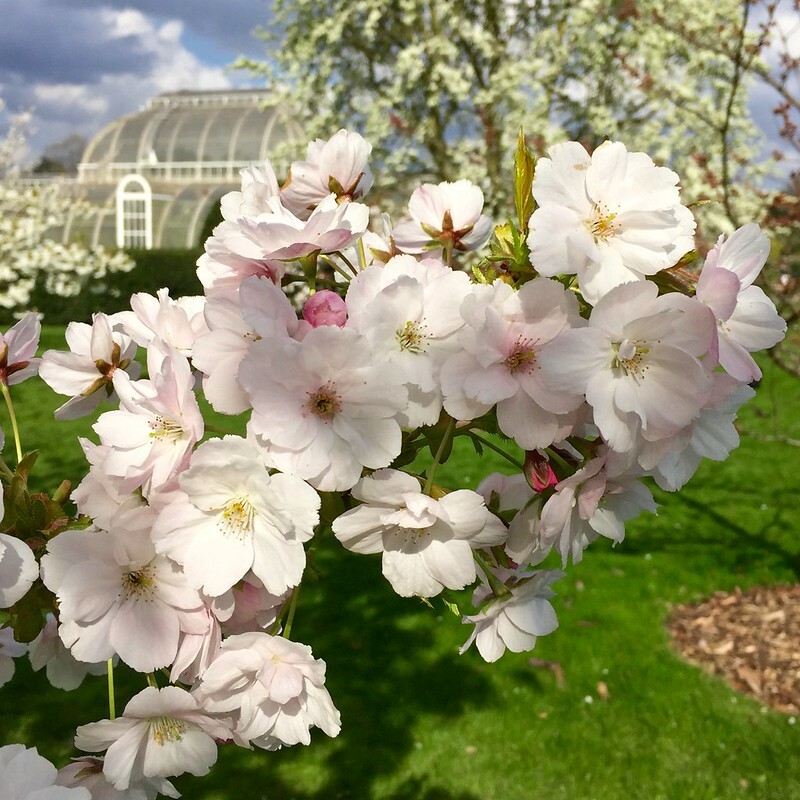 Thank you so much for all these posts related to the cherry blossom in London… What would be the best time this year to visit Kew Gardens? I can’t be there next weekend, so it would be either the next couple of days or towards the end of April… How long do the flowers last? I’d go for the end of April. The blossom is a little late this year so I think you’ll be fine then. What a wonderful post! I will be in London in this year, I love blossom in my country. And I just want to check is there any blossom in London and yey, I found this post. I visited Greenwich last week but I didn’t see blossom road. Am I late? Or should I go next weeks, Could you explain me where it is exactly in Greenwich park. I am a tourist maybe I didn’t find it. Thank you! The blossom in Greenwich is late flowering so try next week. It’s behind Ranger’s House – up the hill beyond the Observatory. Hi ~ The cherry blossom pics are so pretty! Thank you so much for your sharing ! I will visit London on early of April, may i know which places or gardens is better place to see the cherry blossom ? Kew Gardens is your best bet. look forward to hearing when you recommend to see the blossom this year!! (2017) ive seen a few already so maybe in a few weeks they will be in full bloom? Looks like the blossom this year is running about 2 weeks ahead of expectation. So it could peak in early April, depending on the weather. Hi Fran, thanks for sharing these information, really helpful! I’ll be in London end April, may i ask which garden do you recommend going during that period to catch the cherry blossoms? Sorry, I don’t see the cherry blossom lasting beyond this weekend (22nd-23rd April). See my latest blog post for details. But there’s plenty of other flowers to see in London, so don’t despair! Your information is really helpful!! We are planning our cherry blossom vacation in London next year(2018), the mid April seems to be the best time, right? Yes, mid to late April is your best bet. Enjoy your holiday! You’re welcome! Enjoy your holiday.